Follow these tips before, during and after you transfer to a US college. Do you attend a two-year community college but want to transfer to a four-year college or university? Are you moving to a different part of the state or country? Do you want to attend a college or university that is a better fit with your personality or academic goals? Whatever your reason for transferring to a different college, a few tips will help make your experience easier and more rewarding. Carefully consider which college you want to attend. Compare schools and narrow down your choices based on their academic programs, the number and diversity of college students, the location of the college and other criteria that are important to you. Check if your current college has a relationship with a nearby 4-year college. Community colleges sometimes have relationships with local colleges or universities, making it easy for you to transfer college credits. Get a copy of your official transcript. Understand how to read it. Meet with an adviser at your current college. Your adviser can explain what you don’t understand about your transcript and make sure it is up-to-date. Tell your adviser that you are considering a transfer to another college. Your adviser can help you choose courses that are more likely to transfer. Give yourself time to transfer colleges. Pay attention to college application deadlines. You may want to apply up to a year before you plan to transfer to your new college. Contact the advising office at your prospective new school. Some colleges have advisers specifically for students who plan to transfer. Find out which of your college course credits will transfer. Speak early and often with your college adviser. Make sure you understand which of your academic credits transferred, and whether those credits counted toward your college major or as an elective. Your college adviser can help you choose the classes you need to take to graduate on time. Many colleges and universities are accustomed to transfer students and can guide you through the process. Ask for help on and off campus as often as you need it. In no time at all you will be attending classes on your new college campus! P.S. 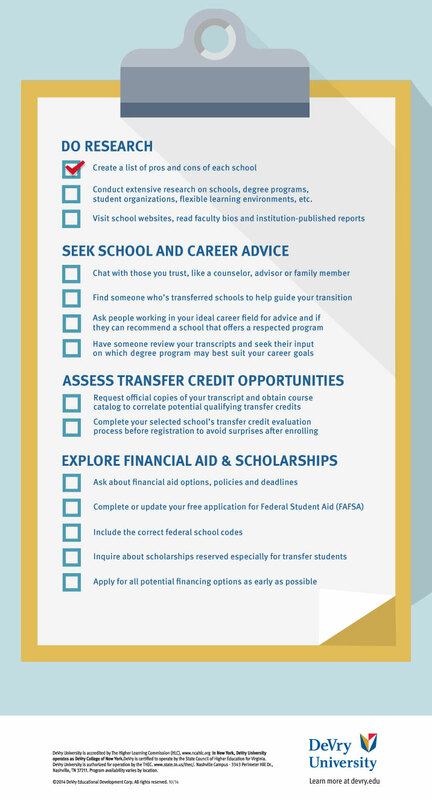 Here’s a helpful transfer checklist from our friend’s at Devry to help you stay on track! This infographic was created by DeVry University. DeVry offers students the chance to earn their bachelors degree online.